Every year our Scoutmasters nominate Scouts who they feel best exemplify Scouting's Ideals. These are Scouts who have been instrumental in assisting other Scouts and adult leaders and have demonstrated their leadership by example. In 2016, 55,186 Scouts earned the rank of Eagle Scout. Around 7.56 percent of all Boy Scouts earned the Eagle Scout rank in 2016. In 2016, the average age of boys earning the Eagle Scout rank was 17. From 1912 to 2016, more than 2.4 million Boy Scouts earned the Eagle Scout rank. Since the inception of the award in 1912, 2.01 percent of eligible Scouts have earned Scouting’s highest honor. See: What percentage of Boy Scouts become Eagle Scouts? 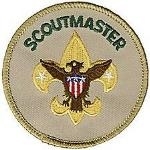 Check out the Troop 33 Eagles' Nest for a complete list of Troop 33 Eagle Scouts over the years. 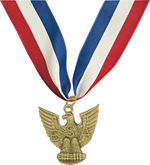 The BSA National Youth Leadership Society (NYLS) is a national honor society. The purpose of the NYLS is to "recognize youth members of the BSA who have learned and practiced outstanding leadership skills – the elite of our program." Since its inception in 2009, only 174 youth have been inducted into the NYLS (as of August, 2015). The Stanford District Flame of Leadership award is nominated annually by the Committee to recognize outstanding service to the Troop by an adult volunteer. We are very fortunate to have so many incredible adults whose contributions have made the Troop what it is today. Projects a positive image of Scouting in the community. The District Award of Merit is a council award presented by districts in the same manner that the Silver Beaver is a national award presented by councils. 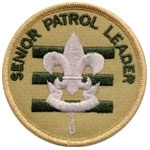 The award is available to Scouters who render service of an outstanding nature at the district level. 1996 - William "Bill" Stark, Jr.